Trust is a key dimension in the principal-agent relationship and it has been studied extensively. However, the dynamics, evolution, and intrinsic motivation and mechanisms have received less attention. This paper investigates the intrinsic motivation of trust and it proposes a theoretical model of trust evolution that is based on the notion of ‘trust response’ and ‘trust spiral’. We then specifically focus on trust within the lending relationship between banks and small businesses, and we run numerical simulations to further illustrate the evolution of involved mutual trust over time. Our model provides implications for future research in both trust evolution and small business lending relationships. Since the 1990s, trust has received considerable attention across many disciplines, ranging from psychology to economics. As a crucial element of any social system, trust is introduced to achieve optimal contracts and improve institutional efficiency. Even when confronted with the potential risk of being betrayed, a trustor is willing to endow trust in a trustee, which cannot be explained by traditional economic theories under the assumption that they are rational economic entities who are only concerned about their own monetary payoff. A large quantity of literature has studied fairness and social welfare in human decision making and has found that theories of reciprocity and altruism provide supportive explanations for these non-selfish behaviours (Fehr and Schmidt, 2006). This paper develops an evolving model of trust based on the notions of ‘trust response’ (Pettit, 1995) and ‘trust spiral’ (Nooteboom, 2002). After analysing the motivation of trust and trust propensity, we further propose a new trust utility function that will be used as the basis of a trust spiral model. The development of trust in this paper is transformed into the evolution of trust propensity along with time t. Our main standpoint lies in the fact that behavioural trust is driven by potential motivations and is caused by trust antecedents on the basis of the subjective perception of trust, as supported by Das and Teng (2004). We focus on trust within a lending relationship between banks and small businesses, as suggested by the empirical research (Moro and Fink, 2013; Howorth and Moro, 2006; Howorth and Moro, 2012; Saparito and Gopalakrishnan, 2009; Harhoff and Körting, 1998). Trust plays an incredibly important role in borrower-lender relationships. In fact, lenders, or more correctly, loan managers, are asked to take decisions about whether to lend, even when they will be repaid quite far into the future. In other words, they are asked to deal with a very high level of uncertainty about the future behaviour of the borrower. They are typically asked to extrapolate future behaviour based on information about the borrower (Moro et al., 2015). More specifically, they are asked to evaluate whether the borrower has the capability to ‘properly’ use the money so that they will be able to repay the loan, as well as the willingness to repay the loan. Interestingly enough, past behaviour can help the lender to develop an idea/opinion about the borrower’s capability to repay the loan (according to their skills as managers) but it can only provide marginal information about the willingness to repay it. Thus, the final decision implies a decision about whether the lender trusts the borrower. The lending decision process (and one can generalise, the bank activity) can be reduced to the following question: Can the borrower be trusted? This process is even more relevant in the case of a small business. In the case of the lending process for medium and large organisations, lenders can rely on large amounts of consolidated data that can help them to develop a proper picture of the borrower, in particular about their ability to repay the loans. In addition, this kind of organisation is run by a management team with the support of middle management staff. Therefore, a firm’s capacity to repay the loan does not depend on the behaviour of just one person or very few people and, therefore, the risk in terms of the lack of willingness to repay the loan is also reduced. Consequently, the information asymmetry and the adverse selection risk are reduced (Jensen and Meckling, 1976; Williamson, 1988). In the case of small firms and micro firms, the action of a single person (the entrepreneur) is essential for the success/failure of the venture and the ability to repay the loan. Similarly, the lack of willingness to repay a loan made to just one person (the entrepreneur) can adversely affect the possibility of the lender being able to recover the loan. The problems are amplified by the fact that information available to the lender is reduced, less reliable and is not necessarily updated. Interestingly, the increase in the level of information asymmetry and the increased risk of adverse selection increases the role of lender trust in the borrower. However, irrespective of the relevance of the topic and empirical evidence, research has not properly developed a theoretical model to describe the evolution of this process. Our research contributes to trust and small business lending literature by looking at a quantitative and endogenous perspective of trust evolution. We also provide a suggestive explanation for its evolution from the perspective of motivation of trusting behaviour and trust propensity. The rest of this paper is organized as follows. Section “Literature review” reviews the literature. Section “Model” explains trust propensity and constructs the trust utility function. Section “Application in small business lending” discusses the application of the trust spiral model in small business lending. The results of the model simulation are presented in Section “Simulation results”. Finally, Section “Conclusions” concludes this paper. Relationships based on trust are rooted in imperfect information: if the trustor has access to all the information and can systematically monitor the behaviour of the trustee, then there is no point to take a leap of faith or, to put it in other words, there is no need to trust others. Mayer et al. (1995, pp712) define trust as “the willingness of a party to be vulnerable to the actions of another party based on the expectation that the other will perform a particular action important to the trustor, irrespective of the ability to monitor or control that other party.” Nooteboom’s (2002) definition of trust stresses the expectation that a partner will not engage in opportunistic behaviour, even in the face of countervailing short-term opportunities and incentives. Research suggests that information and trust have a positive and non-monotonic relationship. Under the condition of complete information, trust is redundant. Meanwhile, under the situation of incomplete information with some risk and uncertainty, trust is likely to be introduced (Fisman and Khanna, 1999; Uzzi and Lancaster, 2003). A set of institutional or environmental factors that influence the floor level of information is needed to enter a trusting relationship, including the ceiling level of information above which trust becomes redundant (Rooks et al., 2000). The hypothesis of self-interest is considered to be a basic assumption in traditional economic theories (Williamson, 1988). However, this hypothesis has increasingly been challenged by a large number of experimental findings during the recent two decades. These findings show that people are not only concerned with their own monetary payoff but also are concerned with the payoff of others. Based on this experimental evidence, complicated social preferences have been proposed to be rooted in human behaviour and this can help to provide convincing explanations for those non-selfish phenomena (e.g. Andreozzi, 2013). Among these social preferences, reciprocity, altruism, and inequality aversion all supply distinct perspectives, which can be classified into two strands. First, reciprocity stresses mutual intentions. During interactions, a first mover’s behaviour showing trust is likely to induce the counterparts’ fulfilment of his or her anticipation, and vice versa. Thus, trusting behaviours tend to be reciprocated with positive responses that validate trust. This is consistent with Pettit’s (1995) notion of ‘trust-responsiveness’. The studies by Dufwenberg and Kirchsteiger (2004), and Falk and Fischbacher (2006) have improved the theory of psychological games proposed by Rabin (1993), mainly in the respect that each player’s kindness function depends on his or her available equitable payoff. These studies have also made a significant contribution to the development of reciprocity theory. The second strand is based on a positive attitude towards human nature. This strand stresses the fact that people consider altruism in their behaviour and tend to be inequality adverse. In other words, people are not only concerned about their own payoff but are also concerned about the payoff of others. Among those that support this view, Cox (2004) referred to these kinds of preferences over others’ monetary payoff in addition to their own payoff as the ‘other-regarding preference’; in the same way that altruism, inequality aversion and vulnerability-responsiveness are the most important drivers for trustworthiness. Barney (1990) argues that an alternative set of assumptions about human nature including altruism is valid and can be integrated into traditional organizational economics. Finally, Mansbridge (1999) suggests that one crucial form of trust is altruistic trust, pointing out that an altruistic nature is involved in each trust relationship (Ferrary, 2003). We should not neglect other motivations of trust like altruism, as pointed out by Dufwenberg and Kirchsteiger (2004). Trust antecedents can fall into two categories, trust propensity and trustworthiness (Mayer et al., 1995). Trust propensity refers to the trustor’s tendency to trust others and is more likely to be treated as a stable personal characteristic (Mayer et al., 1995; Das and Teng, 2004). With respect to trustworthiness, ability and intentions are accepted as the dominant source of trust, corresponding to ability trust and goodwill trust (eg. Nooteboom, 1996). Mayer et al. (1995) further classify the perceived trustworthiness about a trustee into three different aspects: ability, benevolence and integrity. From the perspective of risk, Das and Teng (2004) differentiate subjective trust and trust antecedents from behavioural trust and they construct a risk-based conceptual framework. Nevertheless, the combination of motivations and antecedents of trust has not been fully studied. Research on trust emphasizes that a high level of trust can not only encourage trustworthy behaviour (Nooteboom, 2002; Pettit,1995) but can also decrease agency problems and transaction costs, including expenses of monitoring and control (Macaulay, 1963; Zand, 1972; Ring and Van De Ven, 1992). A trust relationship is not static but evolves in a dynamic process along with the interaction between trustor and trustee and the previous experience in terms of trust and reciprocation. Thus, the process is a spiral that is a continuously harmful increase or decrease in trust, which gradually gets faster and faster. The spiral of trust can be either upward or downward. The relational trust behaviour, where both parties display trust, tends to spiral upward, creating stronger relationships; distrust reproduces itself in a downward spiral (Friend et al., 2010). Zand (1972) developed a conceptual model that clarifies the logic relationship between participants’ behaviour and their counterparts’ trust and suggests the importance of support for the spiral-reinforcement model: mutual trust or mistrust, among members of a group, is likely to be reinforced, unless there is marked or prolonged disconfirming behaviour. Pettit (1995) proposes the notion of ‘trust-responsiveness’, based on which Nooteboom (2002) explains how the upward spiral and downward spiral of trust can happen. Lewicki and Wiethoff (2000), Lewicki and Bunker (1996) and Kramer and Lewicki (2010) stress that trust evolves from activity-based trust to relationship-based trust to identification-based trust. However, they stress that the development from one stage to the following, more solid one, is based on testing and re-testing trust via continuous iterations. This can be seen as a spiral where the trusting relationship is retested many times. However, all of these studies are devoted to the conceptual construction of the development of trust, while a detailed modelling of trust evolution and how it spirals up and down has not yet been fully explored. Several studies extend this line of research on the evolution of trust into other areas. For instance, Ybarra and Turk (2009) discovered that the transaction cost perspective of trust may actually serve to make partners suspicious of each other and force companies to invest in specific assets that may actually create a spiral of distrust among the participants. Similarly, Wang and Murnighan (2017) studied the dynamics of punishment and interpersonal trust and found that people trust punishers more than non-punishers, but only when punishers are not motivated by revenge. However, little attention has been paid to the evolution of trust within a bank lending relationship. Research on trust has also looked at the specific context where it arises in the buyer-supplier relationship-performance spiral (e.g. Autry and Golicic, 2010; Celuch et al., 2011; Liu, 2012) and in project business (e.g. Smyth et al., 2010). As far as a lending relationship is concerned, empirical research is quite limited and it is mainly based on the fact that trust can promote cooperation (Gulati, 1995; Das and Teng, 1998) and facilitates decision making in a situation with scarce information (Luhmann, 2000). Especially in small business lending, a high degree of risk and uncertainty is involved, with more severe information asymmetry. McCabe et al. (2003) suggested that the lending relationship between a bank and an enterprise is a reciprocal trust relationship. Some studies provide empirical support for the role of trust in small business enterprise lending (e.g. Moro and Fink, 2013; Howorth and Moro, 2012). Palazuelos et al. (2017), using Spanish data, found that accounting information quality is relevant in trust formation and affects the willingness of a bank to grant credit. Massaro et al. (2017) explored the joint effect of trust and control mechanisms on knowledge transfer in the networks of SMEs and they found that trust substitutes for the implementation of boundary, diagnostic and belief tools. Enimu et al. (2017) examined the determinants of loan repayment among agricultural microcredit finance group members in Delta state, Nigeria. No detailed modelling has been proposed in terms of trust evolution. The only model that describes trust in the lending process has been proposed by Howorth and Moro (2006). However, while their model focuses on describing the trust process, it does not explore the dynamics of trust evolution. Therefore, in this paper, we aim to correct this gap in the research. Following Mayer et al. (1995), we assume that trust antecedents fall into two aspects, one is the trustor’s perceived trustworthiness of trustee and the other is his or her trust propensity. In the respect of trustworthiness, a trustor could make a subjective evaluation about the trustee’s ability, benevolence and integrity through collecting related hard and soft information. Trust propensity is more likely to be an individual trait. As proposed by Castelfranchi (2008), it is trust attitude that prompts the trustor to make the trust decision and gauge the behaviour of trusting. We propose that it is the trust propensity that determines a trustor’s willingness of take trusting behaviour, which comes from three components, namely: self-interest, reciprocity and altruism. Based on the framework of the psychological game by Rabin (1993), our model is constructed on the basis of trust utility functions. Although we assume that reciprocity and altruism are also involved in the trust behaviour, the goal of utility maximization still holds in our model. Several studies have made important extensions of utility theory with the support of experimental data, including: (1) fairness equilibria (Rabin, 1993); (2) a theory of altruism (Levine, 1998); (3) self-centred inequality aversion (Fehr and Schmidt, 1999); (4) equity, reciprocity and competition (Bolton, Ockenfels, 2000); (5) a social preference model (Segal and Sobel, 2007); and (6) a model of altruism and inequality aversion (Kohler, 2011). Nonetheless, nearly all of the parameters, including trust propensity, are assumed in these models to be constant in these linear utility functions and their evolution has been largely neglected. where αi is the self-interest propensity of player i, πi(ai(h), bij(h)) is his monetary payoff received at history h when his strategy is ai(h) and his belief about player j’s strategy is bij(h). Following the related literature (Rabin, 1993; Levine, 1998; Fehr and Schmidt, 1999; Segal and Sobel, 2007; Kohler, 2011), we propose αi = 1. Tanis and Postmes (2005) present a social identity approach to trust, indicating that interpersonal trustworthiness enhances expectations of reciprocity, which in turn increases trusting behaviour. Their study also provides evidence for the reciprocal motivation of trust. According to the theory of reciprocity (Dufwenberg and Kirchsteiger, 2004; Falk and Fischbacher, 2006), a trustor’s behaviour is perceived to be kind or unkind by a trustee, and it then receives a behavioural reaction. Thus, the reciprocity utility is formalized to consist of a kind (or unkind) treatment, which is represented by the kindness term, and a reaction to that treatment, which is represented by the reciprocation term. In Zand’s (1972) model, the trustee’s perception of a trustor’s intention and choice determines their conclusion about that trustor, as well as his final behaviour choice. Thus, the reciprocity utility term consists of two dependent components: kindness function and reciprocity propensity. Under trustor i's strategy ai(h)and his first-order belief bij(h)j ≠ i, iffij(ai(h), bij(h)) > 0, it seems that i is kind to j, and vice versa. Under trustor i'sfirst-order belief bij(h)j ≠ iand second-order belief ciji(h)j ≠ i, iffiji(bij(h), ciji(h)) > 0, it seems that ibelievesjis kind to themselves, and vice versa. As stated above,bij(h) = aj(h) and ciji(h) = bji(h) = ai(h)both hold; then, the reciprocity function fiji(bij(h), ciji(h)) equals to fji(aj(h), bji(h)) mathematically. Andreoni and Miller (2002) suggest that people do not focus on their own payoff or utility alone but that they also pay attention to the fairness of outcomes and there exists a positive correlation between their payoff and others’, which is so-called altruism. Similar to reciprocity propensity, we define altruism propensity as the personal concern of a trustor about the trustee’s payoff or utility: it is the weight that is assigned by the trustor to the payoff of the trustee. The higher the trustor’s altruism propensity, the more he is willing to improve the trustee’s payoff. Since Levine (1998) proposes that players’ payoffs are in line with their own and their opponents’ monetary payoff, linear altruism models have been adopted extensively in related literature (e.g. Ioannou et al., 2013). Kohler (2011) proposes that the altruism propensity is positive and the value interval is [0,1]. A positive altruism propensity indicates that the altruism utility of a trustor increases with the monetary payoff of a trustee. Both reciprocity and altruism preference are related to social welfare, and social distance is likely to exert an important influence on them (Hoffman et al., 1996). Long-term relationships between banks and small businesses help to reduce the information asymmetry. Engle-Warnick and Slonim (2006) further find that past relationship lengths also affect trust and trustworthiness. For banks, they are more concerned about the payoff or utility of those borrowers that maintain longer and closer relationships with them. For borrowing businesses, they are more likely to show a higher altruism propensity to maintain the hard-earned lending relationship with banks. Similar to reciprocity preference, the altruism preference also lies in the inequity aversion, and fairness of the outcomes may also affect the altruism propensity. Regarding how a trust spiral may occur, Pettit (1995) proposes the notion of ‘trust-response’, which is related to the desire for social recognition and to the notion of social reciprocity. When offered trust, people may reciprocate “people’s love of regard or standing in the eyes of others”. Based on this idea, Nooteboom (2002) further argues that trust is reciprocated and there is a possible upward spiral of trust. However, when trust is not reciprocated, there is likely to be a downward spiral of trust. The trust spiral within the bank–firm lending relationship can be understood as follows: the spiral of trust occurs in both the reciprocity propensity and altruism propensity along with time t, indicating that the trustor’s propensity to trust increases along with time t in the situation of beneficial interactions with the trustee and declines when the trustee undertakes opportunistic behaviour. Practically, we use time t to measure the length of the time period of interactions between the bank and small business. Each time unit begins when the bank makes the loan decision and ends when the small business finishes its repayment. Thus, the lending practice could be presented by an extension of a two-stage game (Fig. 1). In this paper, we restrict our focus to the one-shot interaction without nature, where each player knows all of the preceding choices and payoff structures of the game. Only pure choices are included in our analysis. We start with a standard game, which is a description of the strategic situation and specifies only the monetary payoff. In this extensive two-stage game, there are two players who make binary choices. Starting with the assumptions of opportunistic players, incomplete information, and sequential rationality, a simple two-player, two-stage dynamic game model is presented. In the first stage of the game, the bank decides whether to grant a loan to the small business, which is referred to as the trust behaviour. The loan contract will not be honoured unless both parties would like to do so. If the bank decides to reject the loan application, indicating that it undertakes the distrusting behaviour, then the game simply ends. If the bank decides to accept the loan application, then a loan contract will be initiated and, therefore, the game enters the second stage, in which the opportunistic small business decides whether to repay the loan. Cooperation occurs only when a loan contract is initiated and both players respect the contract, which implies that the small business respects the contract in the second stage even when it has the option to default. Formally, a bank (B) has two optional strategies in the first stage—trust (T) or distrust (N) —and a small business has two options in the second stage—respect (R) or default (D). Following Mayer et al. (1995), trust within the bank–firm lending relationships stresses that bank trust is the willingness to engage in risk taking behaviour (granting loans), and the bank may possibly monitor and respond to a small business’s actions. Based on this extension form of the credit game between a bank and small business, we consider the outcomes resulting from three strategy portfolios in this game instead of the game equilibrium. First, in the situation of (T, R), a bank shows its kindness and endows trust in a small business by granting loans after assessing the potential risk involved, and the small business repays the loan fully and in time to reward the bank’s trust. Consistent with Pettit’s (1995) notion of ‘trust-responsiveness’ and Nooteboom’s (2002) ‘trust spiral’, in this portfolio, trust behaviour followed by positive response is likely to promote an upward spiral of trust propensities for both the bank and the small business. Second, in the situation of (T, D), a bank decides to trust a small business and shows its kindness by granting loans, while the small business defaults on the loan without rewarding the endowed trust and kindness. According to the notion of ‘trust-responsiveness’, the trust spiral of the trustor (bank) is different from that of the trustee (small business). Specifically, the trust spiral of the bank is likely to be a downward spiral because its trust is not reciprocated. Meanwhile, the trust spiral of the small business is likely to be an upward spiral because its default is rewarded by kindness and trust, which leads to its beneficial monetary payoff. Another situation of this credit game needs to be taken into consideration; that is, a bank decides to trust a small business (T), and the small business respects the loan contract (R) during the first rounds (td); then, the small business starts to default (D) after td. This implies that the strategy portfolio changes from (T, R) during the period of [0, td] to (T, D) during the period of [td, t]. In the first round, trust evolution of both the bank and small business is similar to that in the situation of (T, R), namely, an upward trust spiral. After time td, confronted with disloyal behaviour by the small business, the level of trust that the bank is willing to endow is likely to decline. Third, in the situation of (N, D), a bank does not choose to trust a small business, possibly due to their bad credit history, high potential risk or otherwise. In the case of facing distrust from the bank, the small business will not reward the bank’s distrust or unkindness. This implies that once the bank takes a distrusting stance at the beginning, trust between the two parts is likely to be maintained at the same level as the starting value because there are no interactions to improve their mutual trust propensities. Therefore, no loan contract will be initiated and this will lead to a no trust spiral and no improvement of loan availability for the small business. Consequently, we will not consider this situation in our simulation analysis. In the simulation, we consider a one-shot interaction between a bank and small business to take place repeatedly, and we simulate the evolution of two trust propensities along with the interactions without solving the equilibrium strategies for each player in repeated games. There are nine parameters in our model: A defines the loan amount applied for by the small business; G is the value of collateral demanded by the bank from the small business; r is the lending rate; r0notes the rate of return that the small business receives from the investment of the loan and r0 > r holds; kE and kB are, respectively, the sensitivity to the relationship distance for the small business and bank; eEand eB denote the sensitivity to the average historic payoff for the small business and bank, respectively; and t denotes the time length of interactions between the bank and small business, and each time unit begins when the bank makes the loan decision and ends when the small business finishes its repayment. We present the simulation results on the basis of a particular set of parameter values and consider 360 repeated interactions that happen between the bank and small business (t = 360). To highlight the practical situation of small business lending, we assume A to be a random gradually increasing/decreasing value along with time t (t = 1, 2, 3, …, 360), which depends on the behavioral strategies of both players in the last round. Specifically, we assume that the bank places a level of initial trust and decides to grant the loan applied for by the small business in the first round. Thus, in the case of (T, R), the small business cooperates by respecting the loan contract and the loan amount (A) is assumed to gradually increase. We set this as between 100 and 200 during the period of [0,100], between 200 and 300 during [100,200], between 300 and 400 during [200,300] and between 400 and 500 during [300,360]. The underlying logic for a gradually increasing A is that the level of mutual trust between the bank and small business would also increase with repeated successful lending interactions, similar to the case of a credit card. While in the case of (T, D), due to the disloyal behavior of the small business, the loan amount (A) is assumed to gradually decrease. We set this between 100 and 200 during the period of [0,100], between 50 and 100 during [100,200], between 25 and 50 during [200,300] and between 0 and 25 during [300,360]. In the case of (T, R)–(T, D), the loan amount (A) is assumed to gradually increase in the first rounds ([0, td]), and gradually decrease after td. As far as the value of collateral is concerned, we set G = 0.8 × A, indicating that each loan is not fully guaranteed by collateral because it takes considerable time and cost for the bank to liquidate the collateral. In addition, if the loan is completely guaranteed by the collateral, then there is no real risk for the bank at all. The loan rate (r) is set to 0.06, which is lower than the expected return rate that the small business is able to obtain from investment of the loan (r0 = 0.2). We propose that the small business treasures the lending relationship, mainly due to the fact that the small business credit market is more likely to be a seller’s market in which a bank plays the dominant role. This indicates that the small business is likely to be more sensitive to the relationship distance and to the history payoff than the bank. Therefore, both kEandeEare set to be larger than kB and eB, and we choose the following set: kE = 0.5, kB = 0.4, eE = 0.3, eB = 0.1. Finally, we run simulation tests via Matlab 7.0. Three-dimensional plots between reciprocity propensity (βi), altruism propensity (γi) and time (t) for the bank and the small business are presented. The results can illustrate the evolution of two trust propensities in each strategy portfolio. We first consider a case in which a bank trusts a small business and the small business reciprocates the endowed trust by abiding by the loan contract and repaying the loan fully on time (T, R), which is the Pareto Optimality equilibrium. Fig. 2 shows the results of the simulation run for both the bank and the small business and indicates the development of their altruism propensity and reciprocity propensity along with the interaction period t.
In the first round, the bank chooses to trust the small business and grants loans to the small business. After obtaining the loans, the small business is able to make investments with the funds and receive an investment return that is higher than the lending rate. The small business thus has enough funds to repay the loan and interest. The small business then reciprocates the endowed trust from the bank by repaying the loan fully on time. Thereafter, each round repeats this pattern. Along with the increasing time period t, we find that both the reciprocity and altruism propensity of both bank and small business start from near the zero point, and they continue to grow as interactions happen repeatedly. For the bank, its reciprocity propensity (βB) appears to be an upward spiral with a growing radius. After a short interval of time, its value becomes positive, indicating that the growth of trust propensity of the bank leads to a higher degree of trust, and the bank is consequently willing to endow the small business from a perspective of reciprocity. After several repeated interactions, the small business reciprocates the endowed trust from the bank by fulfilling the loan contract. Its altruism propensity (γB) shows an exponential growth approaching 1 along with the interactions between the bank and small business, which means that the bank is more concerned about the small business and is willing to assign a larger weight to the payoff of the small business. For the small business, its reciprocity propensity (βE) also presents an upward spiral with a smaller growing radius than βB. We believe that the main reason for this is that bank takes the dominant role in the small business lending market and, therefore, the small business may be reluctant to trust the bank in looking for financial funds. It generally takes a long time for small businesses to observe the degree of trust for which a bank is normally willing to endorse small business. Its altruism propensity (γE) also shows an exponential growth along with the repeated interactions. It approaches 1 faster than the bank, which indicates that the small business values the lending relationship and the endowed trust from the bank by assigning a larger weight to the payoff of the bank. In Section “The bank trusts the small business and the small business reciprocates”, we described a case where a bank chooses to endow trust in a small business and the small business repays the loan fully on time to reciprocate trust from bank. However, what happens if the small business chooses to default after gaining trust from the bank? We consider this case in this section (T, D). Specifically, we consider a case where a bank chooses to trust a small business from the first round by granting loans based on its trust antecedents and subjective trust. However, the small business is driven by a high level of self-interest motivation and it decides to default from the very beginning without repaying the loan fully on time. As Fig. 3 shows, the bank’s reciprocity propensity starts to decline across rounds from the first round thanks to the fact that the original trust that it endows in the small business is not rewarded with any kindness. Thus, along with the ongoing repeated interactions, the bank’s reciprocity propensity (βB) presents a gradual downward spiral with a slightly growing radius. The bank’s altruism propensity (γB) also endures a gradual fall after the first round but it stays positive. This indicates that the bank still has a high but decreasing level of social welfare preference with a positive altruism propensity to the small business. This preference determines the level of trust endowed by the bank to the small business via granting loans. Afterwards, regardless of the small business’s behaviour, even though the small business defaults on the loan from the very beginning, the bank sticks to its decision by choosing a trust strategy. As can be observed in Fig. 3, the bank’s altruism propensity (γB) drops sharply from a high level. When the small business is confronted with a high level of kindness and trust from bank, it is also willing to endow a high level of kindness and trust in the bank, and thus its reciprocity propensity (βE) exhibits a gradual increase and presents an upward spiral. In the second round, the bank still chooses to trust the small business by granting loans to it, even with a decreasing reciprocity propensity. The small business then goes on to default on the loan contract and it receives more monetary payoff and trust payoff (kindness) from the interactions with the bank. The small business’s altruism propensity, γE, also shows a gradual decrease approximating 1. This indicates that the level of altruism trust that the small business endows in the bank falls because it is aware that its traitorous behaviour could provoke distrust from the bank, even though it receives a large amount of monetary payoff. In this situation, there are two stages of interaction between the bank and small business. The first is the period of [0, td], during which a bank decides to trust a small business by granting loans and the small business rewards the endowed trust from the bank by repaying the loan fully on time. The second is the period of [td, t], during which the bank keeps on trusting the small business and the small business starts to default on the loan contract after time td. Practically, there are two possible situations where the small business defaults. The first arises when the borrower becomes delinquent because of difficulties in running the business. In this case, the delinquency can affect the level of trust that the loan manager has in the borrower. However, as long as the delinquency is the result of a situation that is ‘independent’ of the borrower’s willingness to repay the debt, the loan manager’s trust will not be wiped out completely because the borrower can still be perceived as benevolent and with integrity. However, this trust will probably decline at a slower pace because, at the end of the day, there are good excuses for the borrower to default. The second situation arises when the small business defaults on purpose. In this case, the loan manager’s trust may be wiped out altogether because there are no excuses for the borrower default (i.e., the behaviour compromises any perception about ability, benevolence and integrity of the borrower). Therefore, the loan manager’s trust should rapidly spiral down close to zero. However, only the strategic choice of the small business is observable and its motivation can only be inferred ex post. However, this is not easily verifiable due to the high cost involved. When the small business starts to default on the loans, it is likely to claim that the cause is due to the delinquency of its customers and is therefore independent of its willingness to default, even when the business defaults willingly. Accordingly, the bank’s reciprocity propensity will change along with the behaviour of the small business during the interactions and is likely to decline after increasing for a time period of td. Meanwhile, for the small business, its trust propensity is unlikely to decrease but instead increases thanks to the increasing payoff received from its default strategy. Assuming td = 200, a bank trusts a small business, and the small business abides by the loan contract during the time interval of [0,200], while the small business defaults during the time interval of [201,360]. Simulations are run based on this set of parameters, as stated previously. Figure 4 reports the results. Figure 4 reveals that trust propensities of the bank and the small business evolve differently. For the bank, its reciprocity propensity (βB) exhibits an upward spiral during the time interval of [0, td], when the bank trusts the small business and the small business rewards the endowed trust by honouring the loan contracts. Meanwhile, after td, βB starts to decrease along with time and follows a fast-downward spiral. This indicates that once the small business starts to default, the level of trust built through repeated lending interactions drops dramatically from the bank’s side. This results in the decreasing reciprocity propensity of the bank (βB). 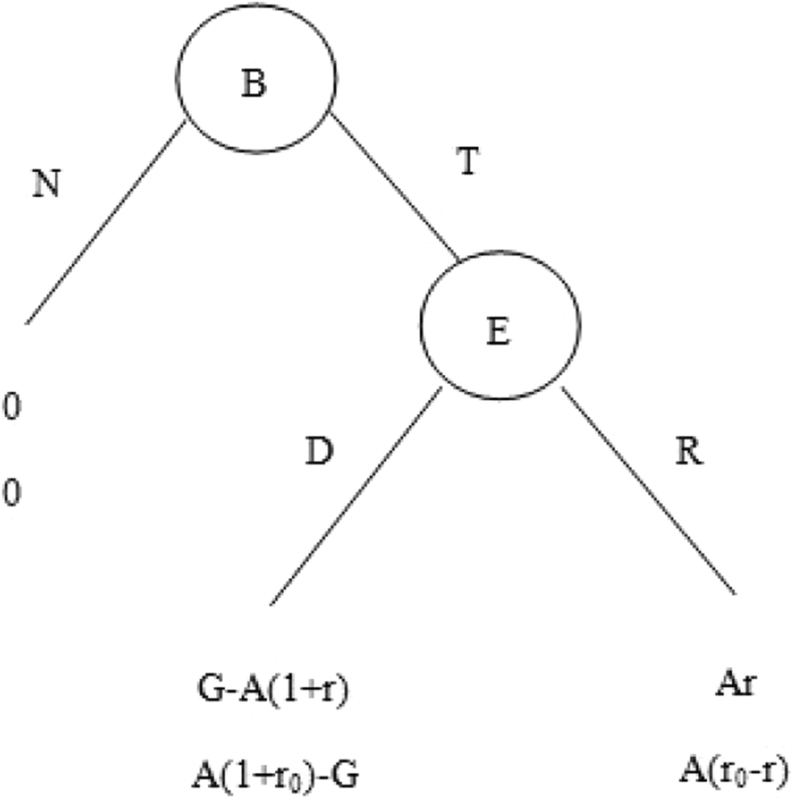 At the same time, the bank’s altruism propensity (γB) experiences a similar evolution. During the first stage ([0, td]), γBincreases along with the repeated interactions and approximates 1. Meanwhile, it gradually decreases during the second stage ([td, t]) due to the change in the small business’s behaviour strategy. For the small business, its reciprocity propensity (βE) continues increasing along with time instead of enduring a gradual or sudden decrease. This indicates that the small business’s propensity to trust the bank grows with the ongoing lending interactions, driven by the reciprocity motivation. This is caused by the increased monetary payoffs that the small business receives from its default. Meanwhile, its altruism propensity (γE) exhibits a similar change as γB. This paper presents a model of trust spiral and it uses the small business lending relationship as an example to examine a credit game. We simulate repeated interactions between a bank and a small business. We suggest that the trust spiral within the lending relationship between a bank and a small business depends on the strategy behaviour taken by both parties. The model that we propose here shows that where the bank trusts a small business and the small business rewards the endowed trust, then the mutual trust level of both the bank and the small business increases along with their mutual interactions. Their trust experiences an upward spiral, which is consistent with Pettit’s (1995) notion of trust-response and Nooteboom’s (2002) trust spiral. Where a bank trusts a small business and the small business takes opportunistic behaviour without repaying the loan, the altruism propensity of both the bank and the small business endures a gradual drop from a high starting value, which approximates 1. For the bank, this fall in trust is mainly due to the distrustful behaviour taken by the small business. Meanwhile, for the small business, trust falls because it is aware that its behaviour will provoke distrust from the bank. The reciprocity propensity of the bank (βB) follows a gradual downward spiral with a slightly growing radius. However, the reciprocity propensity of the small business (βE) follows a gradual increase and presents an upward spiral due to a high level of kindness and trust from the bank. Where the bank trusts the small business and the small business respects the loan contract in the first round but defaults after td, the bank’s trust spiral moves upward before td, and it then falls. Meanwhile, the reciprocity propensity of the small business (βE) continues to increase instead of decrease. This indicates that the small business’s propensity to trust the bank grows with the ongoing lending activities, driven by the reciprocity motivation. Meanwhile, its altruism propensity (γE) increases along with the repeated interactions, which approximates 1 during the first stage. It then gradually decreases during the second stage, after it takes the default action. Our model has observed some limitations. First, we focus on the evolution of reciprocity propensity and altruism propensity without considering the overall trust utility function, based on which each player makes his or her behaviour decision. Second, as Engle-Warnick and Slonim (2004) have suggested, concerns for the future of a relationship with repeated interactions are important for trust to persist. Our simulations are repeated games, and we do not consider that the lending relationship with repeated interaction may in the future affect the generation, development and persistence of trust. Finally, where the small business defaults, we only consider the case of the business repaying nothing of the loan and we ignore the possibility of a partial repayment. Nevertheless, irrespective of these limitations, our model represents the first attempt to mathematically model the evolution of trust in a lending relationship after considering the reciprocal and altruistic behaviour of the players. Our model also provides a suggestive explanation for trust evolution based on motivation of trusting behaviour and the trust propensity of the trustor. Our theoretical analysis may also provide implications for experimental researchers who wish to examine trust evolution from motivation and trust propensity in experimental designs. As exemplified in the work of theory of sequential reciprocity, a trustor’s reciprocity and altruism, as well as his or her perception of a trustee’s reciprocity and altruism may change after different histories, and the interaction history h is introduced to capture this. For example, ai(h) denotes the updated strategy choice of trustor i at the nod h and bij(h) represents the updated beliefs of trustor i about the strategy of trustee j at the nod h. The updated belief is an effective way to deal with the changing preferences when unexpected choices occur. We thank the feedback received by discussants attending the Twelfth International Conference on Management Science and Engineering Management (ICMSEM) where the previous version of the paper has been published as a proceeding. We acknowledge the National Natural Science Foundation of China for the financial support and three universities of co-authors for providing necessary research resources. We also thank the anonymous referees for their valuable comments to improve the quality of this paper. A previous version of this paper was published in the proceedings of the Twelfth International Conference on Management Science and Engineering Management (ICMSEM), and we have received permission from Springer Nature to reuse part of the content in this journal. We acknowledge the National Natural Science Foundation of China (Grant no. 71703127) to support this research. This research is supported by the National Natural Science Foundation of China (Grant no. 71703127). The paper employs no real data or materials in the analysis. The authors have corresponding contributions as the order indicates. All authors read and approved the final manuscript.